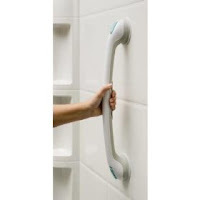 Grab bars in the bathtub or shower can be a life saving piece of equipment. They are available at most large hardware stores such as Home Depot, Lowes and Orchard Hardware (OSH). Many large chain drugstores also carry some and medical supply ho uses stock them in a variety of lengths. They can be installed by the average DIY handy person, but they must be installed according to the directions to ensure that they are safe and work as expected. Attaching to a stud is recommended when possible and using toggle bolts or inserts when not. When drilling through tile, special precautions should be taken and a dab of silicon can help to waterproof the screws and holes. Professional grab bar installers may also be consulted. In most instances, a home safety assessment by a physical therapist from a home health agency would be a covered expense under Medicare if the client meets the homebound criteria. The therapist can consult on the size and placement of the grab bars (but will not install them for you). Once installed, the therapist can make a return visit to instruct you and the client in safe and proper use of the grab bars. The therapist can also assess the entire home and make recommendations for improved safety and other equipment that may be needed. The client's physician must order the assessment. 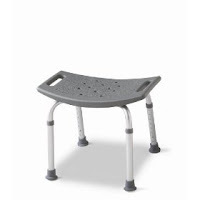 A bath bench or chair can be a very useful safety device especially if the client gets short of breath or tires easily. A lawn chair can work in a pinch, but it should be used with a non-slip mat to ensure that it doesn't move or slide. It may tip easily too and the client should not use it for security or bal ance. Some bath benches or chairs come with a hole to allow for any incontinence and ease of cleaning the client's bottom. Again, the physical therapist can instruct in the safe use of the bath bench or chair. Or they may refer to an occupational therapist for instruction in bathing and hygiene with the adaptive equipment. A raised toilet seat may be recommended for those who have difficulty bending to or rising from the toilet. Anyone who has had hip or knee surgery usually has this ordered post operatively. These come with or without safety rails attached. These safety rails are available for the toilet without the elevated seat as well. These can be especially helpful for anyone who needs something to push with to get up or may not be secure sitting on the toilet. You can view some of my suggestions on the Aging Parents Store at Amazon.com. Thanks!